The Autocar Company is an American specialist manufacturer of severe-duty, Cab Over Engine vocational trucks, based in Hagerstown, Indiana. Started in 1897 in Pittsburgh, Pennsylvania, as a manufacturer of Brass Era automobiles, and trucks from 1899, Autocar is the oldest surviving motor vehicle brand in the Western Hemisphere. The last cars were produced in 1911 and the company continued as a maker of severe-duty trucks. In 1953 Autocar was taken over by the White Motor Company which made Autocar their top-of-the-line brand. White was taken over in turn by Volvo Trucks in 1981 with Autocar continuing as a division. In 2001, Autocar was acquired by GVW Group, LLC, which revived Autocar as an independent company. Autocar now builds three models of custom-engineered, heavy-duty trucks and has regained leading positions in several vocational segments. The company was called the Pittsburgh Motor Vehicle Company when started in Pittsburgh, Pennsylvania in 1897 but was renamed the Autocar Company in 1899 when it moved to Ardmore, Pennsylvania, outside Philadelphia. One of the company's early cars was the Pittsburgher. By 1907, the company had decided to concentrate on commercial vehicles, and the Autocar brand is still in use for commercial trucks. Autocar is the oldest surviving motor vehicle brand in the Western Hemisphere. Based on the minutes of company board of directors meetings during 1903–1907 it is known that in 1903 the board of directors included the president, Louis S. Clarke, the secretary, John S. Clarke, as well as, James K. Clarke. Both Louis Semple Clarke and his brother John S. Clarke were members of the fabled South Fork Fishing and Hunting Club of Johnstown Flood fame. Autocar founder Louis Semple Clarke (1867–1957) was a successful mechanical engineer. Among Clarke's innovations were the spark plug for gasoline engines, a perfected drive shaft system for automobiles, and the first design of a useful oil circulation system. Clarke's initiative to place the driver on the left hand side of the vehicle was ahead of its time but eventually became the standard in much of the automotive industry worldwide. Clarke also developed the first porcelain-insulated spark plugs in America and the Autocar thread specification became the standard in the U.S. automotive industry. Clarke was also a talented photographer. His family were members of the exclusive South Fork Fishing and Hunting Club above Johnstown, Pennsylvania, whose earthen dam at Lake Conemaugh burst on May 31, 1889, causing the Johnstown Flood. Clarke sold his interest in Autocar in 1929 and retired from business. He died in Palm Beach, Florida, on January 6, 1957, and is buried in Allegheny Cemetery, in Pittsburgh. Autocar experimented with a series of vehicles from 1897, with a tricycle, "Autocar No. 1", now in the collection of the Smithsonian. In 1899 Autocar built the first motor truck ever produced for sale in North America. 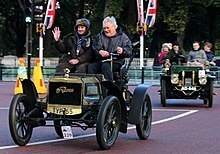 The first production Autocar automobile was a 1900 single cylinder chain drive runabout. About 27 were made. In 1901 Autocar built the first car in North America to use shaft drive. This vehicle is also now in the Smithsonian collection. 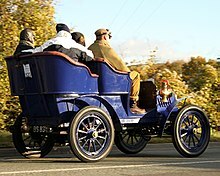 The 1904 Autocar was equipped with a tonneau, it could seat four passengers and sold for US$1700. The horizontal-mounted flat twin engine, situated at the front of the car, produced 11 hp (8.2 kW). This was a somewhat unusual engine design for the time, with most companies producing inline designs. A three-speed transmission was fitted. The steel and wood-framed car weighed 1675 lb (760 kg). The early cars had tiller steering. In 1905 the company was selling the Type XII car for $2,250 and another it called the Type X for $1,000. It discontinued the Type XI and sold the last of them in 1905. The cars then had a wheel steering with left-hand drive. The Type X was a runabout. During the 1905–1906 model year the company produced 1000 Type X cars. The manufacture of 500 Type XV runabouts was authorized for 1907 in place of 500 touring cars (Type XIV) in addition to the 1000 runabouts already planned. At special meeting on June 19, 1906 held at 711 Arcade Building, Philadelphia, Pennsylvania, the board authorized the hiring of a general manager by the name of Harry A. Gillis at a salary of $10,000 per year. Production of 300 Type XVI cars and 500 Type XVII were authorized during a board meeting on November 21, 1906. Commercial vehicles were made the focus from 1907 and soon outnumbered cars. As of 1911, Autocar was making only trucks. The first model, the Type XVII, had a 97-inch wheelbase, a one and a half-ton capacity, and a two-cylinder gasoline engine under the seat. Later engines had 4 and 6 cylinders, and wheelbases became longer. Inline engines became the company's focus. During World War I, the Canadian Armoured Autocar used an Autocar chassis. In 1929, Autocar sold 3300 units, though the number fell to 1000 in 1932 and continued to decline during the Great Depression. Larger trucks with "Blue Streak" gasoline engines and Diesel engines, mainly from Cummins, came later. During World War II, Autocar supplied 50,000 units to the military, including specialty vehicles such as half-tracks; during its entire prewar history, the company had only built 70,000 units. Autocar ranked 85th among United States corporations in the value of World War II military production contracts. Civilian production resumed in 1944 and sales increased greatly after the war. Autocar soon had 100 dealers. However, the boom after the war ended quickly, and in 1953, Autocar sold out to the White Motor Company, which made Autocar their top-of-the-line brand among their "Big Four" brand portfolio. The Ardmore plant was replaced in 1954 with a new plant in Exton, Pennsylvania, though the Ardmore plant burned while being torn down in 1956 and the fire could have destroyed a neighborhood. Autocar's "Custom Engineering" process for meeting each customer's needs led to a reputation as "World's Finest". White replaced Blue Streak engines with its own Mustang, and production of gasoline-powered trucks ended in 1965. AP off-road vehicles became an important product for Autocar. The 1964 AP19 shown in September 2007 at a Golden Age Truck Museum exhibit "has a GCW of 900,000 lbs, a 30,000lb front axle, planetary rear axles rated at 200,000 lbs, and was originally powered with a 525 HP Cummins V-12 diesel which was later replaced with a 6-cylinder Cummins KT rated at 750 HP." The Exton plant ended production in 1980, with production moving to Ogden, Utah. Shortly after the move to Utah in 1980, with White insolvent, AB Volvo acquired the U.S. assets and brands, to become Volvo-White LLC. Volvo produced trucks under both the White and Autocar brands. The last traditional Autocar with a "Custom Driver Cab" was made in Ogden on December 18, 1987. Autocar continued as a division focused on severe-duty trucks. Highlights during this period were DK model trucks, widely used in heavy dump truck, concrete mixer, and refuse applications and the AT64F, a top-of-the-line tractor marketed as "The Legend". Volvo-White bought GMC's heavy truck business in 1987 creating the Volvo WhiteGMC brand. Volvo later dropped any reference to White but used the Autocar bow-tie emblem on the radiator and hood side panels. In 1996 "Autocar" became a truck model name. Autocar remained a part of Volvo until 2001. When Volvo acquired the North American operations of Renault Trucks, including its wholly owned subsidiary Mack Trucks, the merged company would have had an excess or anti-competitive share of the refuse truck market sector. Volvo agreed to sell select vehicle designs for the Xpeditor low cab-forward heavy-duty product, intellectual properties, and the Autocar brand to Highland Park, Illinois-based Grand Vehicle Works Holdings, LLC (GVW). Autocar had previously used White's Xpeditor cab in the Autocar Construcktor 2 (from 1977) and it continued to be used in the ACL and ACM conventional truck models manufactured by Volvo. Once again independent after nearly 50 years, the Autocar company now[when?] employs over 400 at its manufacturing facilities in Birmingham, Alabama (model ACX refuse trucks) and Hagerstown, Indiana, where the company produces custom-engineered Class 8 trucks for severe-duty vocational applications. The company's severe-duty ACX model offers features ranging from improved ergonomic cabs, integrated controls, and complex multiple axle configurations, up to triple-steer, triple-drive 12x6. The Autocar ACX is now[when?] second nationally in several segments, including concrete pump trucks and refuse trucks. The Autocar ACTT is a leading model of terminal tractor. The company has a nationwide service network in the US. Autocar's customer base includes large fleets, private fleets and major municipalities in the United States and Canada such as Miami, Newark, Houston, Chicago and Vancouver. Autocar announced on September 13, 2017, that it had opened a second, 1.2 million square-foot manufacturing site in Birmingham, Alabama. Aircraft and military support trucks, such as tankers and Scissor lift trucks. ^ 100 Years of the American Auto Millennium Edition, Copyright 1999 Publications International, Ltd.
^ a b Manchester, Bob. "Autocar - The World's Finest". 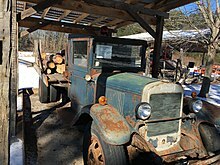 Golden Age Truck Museum. Archived from the original on 2009-08-31. ^ "America on the Move - Clarke gasoline tricycle". amhistory.SI.edu. Retrieved January 16, 2018. ^ "America on the Move - Autocar automobile". amhistory.SI.edu. Retrieved January 16, 2018. ^ "Autocar". GVW Holdings. Archived from the original on 2008-03-29. ^ "Official Autocar concrete pump truck page". ^ "Official Autocar refuse truck page". ^ "Official Autocar ACX truck page". ^ "Official Autocar terminal tractor page". Wikimedia Commons has media related to Autocar vehicles. pennhighlands.edu—Photos by Clarke taken at the South Fork Fishing and Hunting Club.